We are aware of the current developments in Turkey. We are urgently seeking more information. Until the situation becomes clearer, we advise you to avoid public places and remain vigilant. Quite remarkable that Turkish television is broadcasting President Erdogan making a statement from a hotel room via Skype on his mobile. He seems to be telling people that he is returning to Ankara and his urging them to 'take to the streets'. By all accounts he's not very well liked so I guess they'll do the opposite. Something that hasn't been mentioned yet is that Turkey is part of NATO so this could escalate very quickly. I've been watching Sky News mainly and their experts certainly mentioned Turkey's pivotal role in NATO. I've found Sky much better than the BBC News this evening. The BBC were still talking about Nice when Sky was well into reporting the early stages of the coup. Looks like the coup has been put down with soldiers on the Bosporus bridge surrendering. The above linked newspaper article discusses the latest threat situation in various European countries with maps illustrating the perceived levels. Several counties are at a 'high' risk of a terrorist attacks following the horrifying scenes in Nice, in France, and an attempted military coup in Turkey. That is the verdict of the Foreign and Commonwealth Office, which publishes a map showing the perceived threats to some of Brits' favourite holiday destinations. The Home Office says Spain, France, Germany, Morocco, Tunisia, Turkey and the UK itself are all currently at 'high risk'. Poland, Slovenia and Switzerland are among the safest counties to visit, according to the latest advice. Not great news but it's easy enough to get killed on the streets of the UK or on a beach in North Africa! To be honest, right now I'd feel no safer going to any major city centre or resort in the UK or Europe, it's the sad reality. It's all about been in the wrong place at the wrong time. Problem is wherever you go there will always be the threat of terrorism. In the end people just need to carry on with their lives and just be more vigilant for anything suspicious. My condolences to the families of the killed and wounded. This will be pinned to the top as it is a fairly important thread that gives invaluable info to people on the forum. The government advise against all but essential travel to The Gambia because of growing political instability. The Foreign and Commonwealth Office advise against all travel to the city of Banjul. This is the area on Banjul Island around State House, a potential flashpoint in the event of a military intervention. This is well away from the tourist areas. 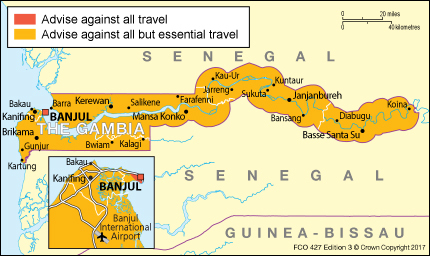 The FCO also advise against all but essential travel to The Gambia as a whole (including Banjul airport) due to ongoing political uncertainty and potential military intervention following the Presidential elections on 1 December 2016. If you’re currently in The Gambia you should leave by commercial means if you have no essential need to remain. Contact your airline or travel company for more information about departure options. The incumbent President, Yahya Jammeh, continues to contest the election results at the Supreme Court, while the President elect, Mr. Adama Barrow, has left the country. The Economic Community of West African States (ECOWAS) has stated it may intervene, including possible military action, if President Jammeh doesn’t step down on the scheduled handover date of 18/19 January 2017. This has led to intransigence on the part of the sitting government, resulting in reports that it has started to take restrictive measures, including shutting down opposition radio stations and making politically motivated arrests. The potential for military intervention and civil disturbance is high and could result in Banjul International Airport being closed at short notice. It hasn’t always been possible for the British Embassy to gain early access to detained British nationals in The Gambia. If you’re living in The Gambia, you should contact the British Embassy who will be able to advise on how to contact consular staff in the event of an emergency. There are a number of checkpoints operating in and around the capital. Expect your vehicle to be searched if you’re stopped by security forces. 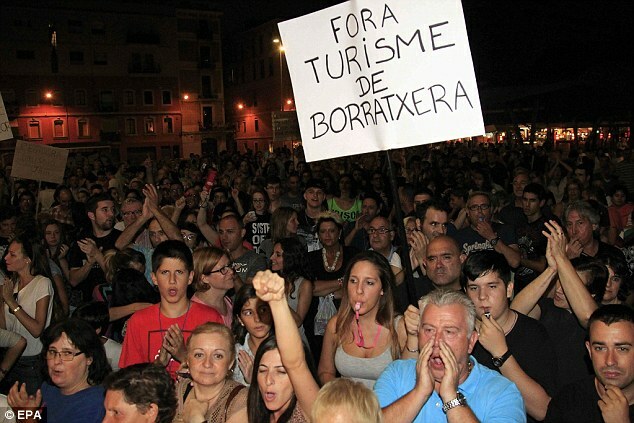 Over the last couple of weeks Barcelona has seen some sizable demonstrations with locals demanding more is done to reduce the number of tourists coming to the city. "a planned “occupation” on Saturday of La Rambla, a street that has come to symbolise what many view as the excessive and unsustainable number of tourists. The occupation has been organised by the Barcelona Urban Neighbourhood Association, along with more than 40 residents and community associations. Under the slogan “Barcelona isn’t for sale” the protesters are calling for an end to property speculation, which is pricing residents out of the city, and to low-wage jobs in tourist service industries." Many of the local newspapers have run articles about Brits and Italians binge drinking, with some Italians reportedly running naked down the streets. Although Barcelona is still regarded as a safe place to visit we would advise visitors to the city take extra care over the coming weeks as tensions are running high in some parts of the city. Ongoing incident in Barcelona where a vehicle has apparently driven down Las Ramblas "trampling a number of people". People are taking shelter in Cafés and shops. Spanish Police have confirmed this is a terror attack. First posted on the homepage. Security advise for people travelling abroad. The footage is based on a Mediterranean Hotel but it's relevent for any location home or abroad. As the video suggest it's better to be prepared should the unthinkable happen but what a sad, sad world we live in now where this kind of atrocity is worthy of a public information film. I couldn't agree more. We've not had anything happen for a while which is good news but the down side to that is it leads to complacency. Everybody should watch this video before they go on holiday, even if it's just a short city break. How many people bother to read the fire escape map on the back of the hotel door? I bet very few.